Today we’re going to take a look at what Warren Buffet is doing wrong. Yes, he’s one of the best—if not the best—investors in history. His style of value investing has made him one of the richest men in the world. But my complaint is not with his investing style. Rather, it’s that his company—Berkshire Hathaway (BRK.B)—does not pay a dividend. Investing is all about making the right choices. 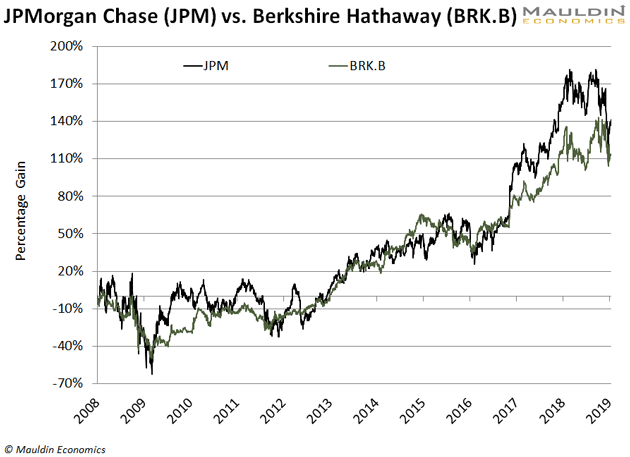 Shares of JPMorgan Chase gained 141% during this period compared to 113% for Berkshire Hathaway. However, when you factor in dividends, JPMorgan Chase crushed Berkshire Hathaway. Since the start of 2008, JPMorgan Chase has regularly paid a dividend. The company’s average dividend yield during this period was 2.8%. That’s not a huge dividend, but it has roughly matched the average S&P 500 dividend yield. A modest dividend might not seem like much, but it really adds up. On January 2, 2008, JPMorgan Chase stock was $42.17. Since then, the company has paid $16.46 in dividends. That boosts JPMorgan Chase’s total return to 180%. Berkshire Hathaway shareholders who didn’t get paid any dividends are left with the same 113%. Over the past 20 years, JPMorgan Chase has showered investors with an 85% return.... from dividends alone! And with interest rates rising, you want to own dividend-paying stocks. Even more important, you must own the right kind of dividend-paying stocks. Broadcasting from Colombia University in New York City, online attendance is FREE. That can lower a company’s earnings and drag down its share price. But this isn’t true for all stocks. How high? Stocks that paid 6.4% or better handed investors returns that beat the S&P 500. Stocks with high dividends beat the S&P 500 in seven of the last 10 periods when interest rates were climbing. You don’t, however, want to buy just any stock with a big dividend. Many companies are forced to pay fat dividends as a way to lure investors. Some of these companies actually borrow money and use the debt to pay their dividend. That’s a disaster in the making for investors. You must look at three key things when evaluating dividends. The most important is the payout ratio. The more debt a company has, the harder it gets to run a business. This includes—you guessed it—paying the dividend. The third is free cash flow. This is the amount of cash left over after a company pays its expenses. If any of these measures is flashing red, you know the dividend is in trouble. A low DSI score tells me that the odds are high that a company will be forced to cut its dividend. A dividend cut is a death sentence for any stock. GE shares were punished on the news, getting chopped over 10%. 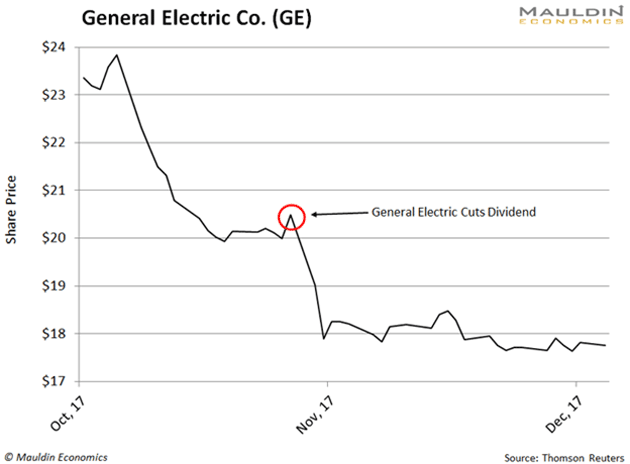 The Dividend Sustainability Index (DSI) will keep you out of stocks like GE. Every stock in my premium investing service Yield Shark passes the DSI. I recently recommended that my readers buy a company that yields 7.4% and scored high on the DSI. Everyone reading this would recognize the name of this company. I’d bet many of you are using their products to read this article right now. We’ve owned the company for only a month and the stock is up 12%. That’s 3% better than the S&P 500 over the same period. And with that safe 7.4% dividend, this company will be rewarding shareholders for years to come. To find out the name of this stock, plus seven other stocks that passed the Dividend Sustainability Index, click here. Warren Buffet likes the power he has, so paying a decent dividend would not give him the extra cash he has to spend on big, newsworthy deals that will attract attention. The “aw shucks” is for show. Spoken like someone who has never experienced the joy of paying dividend taxes at the top tax bracket rate.